It's no surprise that Disney's blockbuster spin-off Rogue One: A Star Wars Story has been dominating the online movie landscape, with fans clamoring to find out everything they can about this big-screen adventure, before they see it again and again. In the five days since it hit theaters on December 16, a number of new details have emerged, including director Gareth Edwards revealing that he actually repurposed some unused footage from A New Hope in Rogue One, while we also learned more about Darth Vader's castle. If you demand more details about Rogue One before the holidays, then you're in luck, because screenwriter Gary Whitta recently held a Twitter Q&A session, where he confirmed that the iconic Nerf Herders were almost featured in Rogue One. Gary Whitta was joined by Star Wars experts Chris Pirillo and Joe Vargas during this live Twitter Q&A session yesterday, where they took questions from the fans about Rogue One. Gary Whitta was the first writer hired for this spin-off, spending a full year working on the script before turning in his draft. Chris Weitz took over the writing duties after that, with Gary Whitta and John Knoll receiving story credit on Rogue One, and Chris Weitz and Tony Gilroy, who was brought in to re-work the script for reshoots, receiving full screenplay credit. One of the most interesting tidbits Gary Whitta revealed during this Q&A is that his first draft originally showed the nerf herders, but he wouldn't say how they were involved in the story. Fans never got to see what an actual "nerf herder" looks like, but the name itself became cemented in Star Wars lore with a line Princess Leia (Carrie Fisher) delivers in Empire Strikes Back, when she insults Han Solo by calling him a "stuck-up, half-witted, scruffy-looking nerf herder." Han's response was also the stuff of legend, telling Leia, "Who's scruffy-looking?" 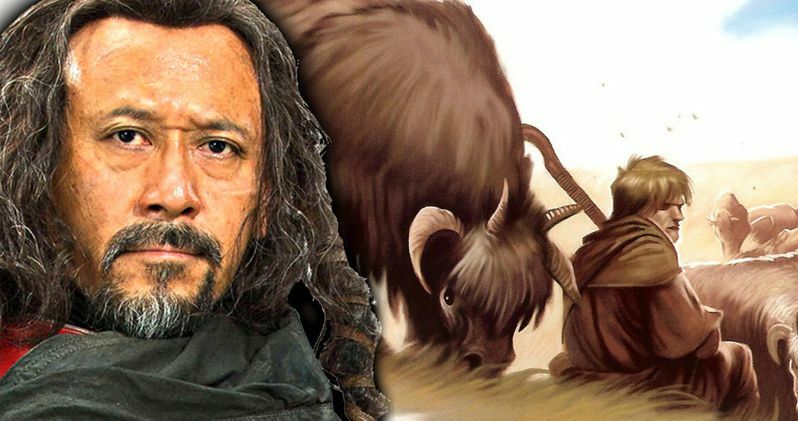 Nerf herders were actual people who rounded up members of the nerf species, who were, "furry, non-sentient animals raised for their milk, meat, and hide," according to the Star Wars Wikia known as Wookiepedia. If they would have been seen in Rogue One, it would have marked the first time the nerf herders were actually seen in a Star Wars movie, but they recently made their first comic book appearance in Marvel's Star Wars #18, which was released in April. Gary Whitta also discussed Galen Erso's (Mads Mikkelsen) act of defiance by purposefully building a flaw into the Death Star plans, which was ultimately exploited by the Rebel Alliance in A New Hope. The writer revealed that the flaw was, "always intended as an act of defiance and also a way to unmake what he was forced to help make." He also added that Galen kept working on the Death Star in hopes that the Empire would let him work on bringing free energy to developing planets, as promised. He also added that Forest Whitaker was the one actor who first came to mind when discussing Saw Gerrera, adding that they were "lucky to get him." It was announced this week that Forest Whitaker is returning to voice Saw Gerrera on the small screen in Star Wars Rebels. When asked if Grand Moff Tarkin teamed up with Vader to take Krennic off of the Death Star project, the writer revealed that, "Vader is above all that internecine rivalry. I don't think he cares which officer he has to force-choke on any given day." He also adds that he thinks Vader chose to make his home on Mustafar, the same place he dueled with Obi-Wan Kenobi, revealing that "it's his choice because he wants to punish himself. As Luke says, there's still good/conflict in him." We have assembled all of Gary Whitta's tweets from the Rogue One: A Star Wars Story Twitter Q&A session, which you can check out below. @ericgeller It was Eadu in my stuff, not sure if that’s changed.